My Top 11 Winter Beauty Essentials | Hair, Skin & More! It seems that no matter what part of the country you’re in, winter has taken its toll this year. Here in lovely MinneSNOWta, we have gotten more than 30 inches of snow just this month! So much for thinking February would be better than January! Not to mention, plenty of cold days ranging from negative 5 to negative 50 with windchill. That’s why I’ve been relying on my winter beauty essentials to save the day. Face Exfoliator – One of the MOST important things you can do for your face during the winter is EXFOLIATE. During the winter, your skin cells dehydrate faster, which is why it is even more important in the winter (though it should be a part of your regular beauty routine) to keep to exfoliate and remove these dead skin cells. By removing dead skin cells, your skin can then produce new healthier skin cells. I have used a lot of exfoliators in the past, but this is by far one of my favorites. It is not only affordable, but it is also 100% vegan and does the job without being too harsh. I have extremely sensitive skin, so it was important for me to find an exfoliator that was effective but gentle on my skin. I also love the mix of sea kelp and French green clay. Your skin definitely feels refreshed and ready to absorb some amazing hydration! Lip Sleeping Mask – One of the most sensitive areas of skin during the winter madness is your lips! I tend to have several chapsticks on hand during the winter and vaseline. At night, I love to use this lip sleeping mask, which is extremely moisturizing and rejuvenates my lips overnight. It’s the perfect way to repair dry and damaged lips! Rosewater Facial Spray – I’ve been obsessed with rosewater products for a while, and this one is amazing. It’s actually a staple for me year round, I just end up using it a TON more during the winter. I spray it on my face in the morning and night after washing my face and before applying moisturizer as well as throughout the day over my makeup. It helps keep my skin extra moisturized and makes my skin look bright and dewy even in the gloom of winter! Face Oil – Face oil is ESSENTIAL for winter. I first started using oils on my face back in 2013 and haven’t looked back. I love the Rose Oil from Pixi. As I mentioned above, I love rosewater products and recently have become obsessed with anything rose-infused. It works really well on my combination/oily and sensitive skin. I will use about two to three drops, rub the oil in my palms and then apply it all over my face. Since I am already beginning to see some crow’s feet, I also apply a couple extra drops right around the edge of my eye. My skin has felt so much smoother and looks more vibrant thanks to this oil. It has also prevented my skin from getting extra dry this winter. To double up on hydration, I actually use this face oil AND my hair oil (mentioned later in this post) together to ensure get that glowy, dewy skin. These oils help me accomplish that summer glow in the winter. Body Brush – As mentioned with the face exfoliator, exfoliation is VITAL during the winter months to remove dead skin cells. I love this brush because the long handle makes it easy to reach every part of your body. I tend to pair this with a moisturizing body wash or the body scrub (mentioned later in this post) to exfoliate all over. I use the body scrub at least twice per week but will use this body brush every time I shower with other body washes. Since the bristles aren’t too harsh it’s okay to use on a daily basis and is a great way to prep before applying a fake tanner or moisturizer! Brightening Eye Cream – I suffer enough with trying to keep my eyes bright and happy during the spring and summer months, let alone winter. That’s why I rely on this brightening eye cream to hydrate the most sensitive area of skin – the eye area! This leaves my eye skin moisturized and helps me look awake and alive in the morning. It also is a LIFESAVER for my dark circles. I have struggled with dark circles for many years, and this eye cream not only helps combat dry skin, it helps reduce the appearance of dark circles. Blow Out Cream – This pre-heat treatment is the perfect addition to your hair-care routine. It not only helps as a heat protective before you blow dry and style your hair, it also gives your hair amazing moisture. It leaves my hair feeling silky and smooth, while restoring moisture. While it helps keep your hair moisturized and replenished, it doesn’t leave your hair feeling greasy or weighed down. Another amazing vegan product that is Leaping Bunny approved! I’m doing my best to introduce clean beauty into my life and have started with my hair care routine and some of my skincare. Hair Oil – We all need amazing hair oil in our lives. If you DON’T USE ONE, A. you should be. B. You are missing out on great hair and C. the one I use makes my hair shiny, beautiful and healthy. If you don’t believe me, let me send you some before and afters. My favorite hair oil is actually multi-use, so it’s not only amazing as a hair oil treatment and fly-away corrector (after you blow dry your hair), it’s also a great oil for your skin! And I’ve been all about oil for your skin for years… I just love something multi-purpose! This oil is perfect for both skin and hair – and lasts for a long time. I’ve only had it for a month, but have used it as a hair mask, post blow dry hair styler AND skin hydration, and I’m pretty sure I’ve used only a tenth of the bottle. It also can be used for extra dry areas of your body – like your elbows! Hopefully, I’m not the only one who suffers from extra-dry elbows this time of year, haha! Advanced Repair Hand Cream – I cannot live without this hand cream during the winter. This is the perfect size to keep at work, in your purse and at home. I try to apply this after I wash my hands to help replenish the moisture lost after washing your hands. It is also great to help ensure your cuticles are staying moisturized as well. SheaMoisture Lavender & Wild Orchard Body Scrub – I am OBSESSED with this body scrub. It is SO affordable and lasts me throughout the entire winter (and more). I love this specific one as well for the amazing scent. The lavender and wild orchard scent gives a restful, relaxing shower experience. I even like to throw a little bit in the tub if I’m taking a bath to release the scents for relaxation. I have never used something that leaves my skin feeling SOOOOO soft and smooth afterward. Even though you aren’t showing as much skin in the winter, using this at least two times per week will ensure your skin is smooth and hydrated to avoid itchy skin. Cocoa Butter Cream – This body butter is ridiculously amazing. I love the way the cocoa smells and it’s the only body butter I’ve found that leaves my skin hydrated without feeling greasy. Again, I also love the price tag! It’s a great deal and due to the size and how moisturizing it is, you don’t need much. I apply this after showering to help restore moisture. It’s also best to use after exfoliating or using the body scrub mentioned above. So there you have it! 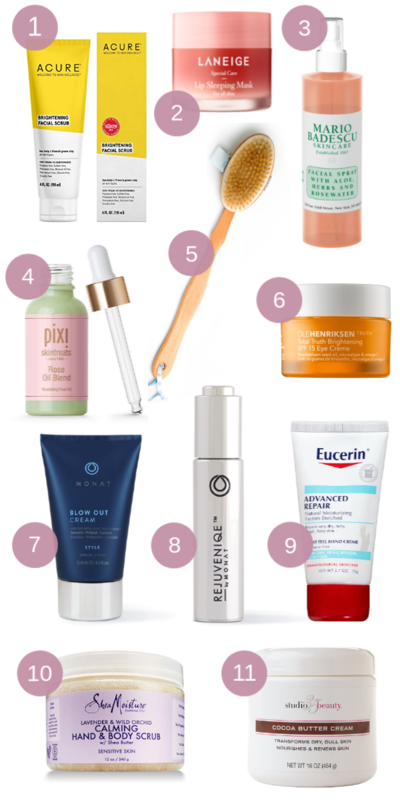 11 of my winter beauty essentials to get me through this tough time of year. And if you are living in a cold area like me, hang it there – we are SO close to spring. And now I also need to know, what are your winter beauty essentials? What should I be adding to my winter beauty routine? Previous My 2019 Birthday Wish List! Thank you! They have been a lifesaver!